Where’s that $4,000 Raise the GOP Promised Workers? Home / Uncategorized / Where’s that $4,000 Raise the GOP Promised Workers? When Republicans in Congress passed a big, fat tax break bill in December, they insisted it meant American workers would be singing “Happy Days Are Here Again” all the way to the bank. The payoff from the tax cut would be raises totaling $4,000 to $9,000, the President’s Council of Economic Advisors assured workers. But something bad happened to workers on their way to the repository. They never got that money. In fact, their real wages declined because of higher inflation. At the same time, the amount workers had to pay in interest on loans for cars and credit cards increased. And, to top it off, Republicans threatened to make workers pay for the tax break with cuts to Social Security, Medicare and Medicaid. The U.S. Bureau of Labor statistics reported this week that wages for production and nonsupervisory workers decreased by 0.1 percent from May 2017 to May 2018 when inflation is factored in. The compensation for all workers together, including supervisors, rose an underwhelming 0.1 percent from April 2018 to May 2018. That’s not what Congressional Republicans promised workers. They said corporations, which got the biggest, fattest tax cuts of all, would use that extra money to increase wages. Some workers got one-time bonuses and an even smaller number received raises. But not many. The group, Americans for Tax Fairness, estimates it’s 4.3 percent of all U.S. workers. Most of the money went to stock buybacks, which enrich corporate executives and wealthy stock holders because they have the effect of raising stock values. Corporations set an all-time record for buybacks in the first quarter of this year. They bought $178 billion of their own shares, up by more than 42 percent from the first quarter in 2017. The New York Times story about this record breaker describes the phenomena way: “Companies buy back their shares when they believe they have nothing better to do with their money than to return capital to shareholders.” So despite promises from the GOP and the President’s Council of Economic Advisers, corporations believed further enriching their own executives and shareholders was a much better way to use the money than increasing workers’ wages – wages that have been stagnant for decades. Form 1945 until 1982, worker pay rose in tandem with productivity. At that time, buybacks were rare, primarily because they were deemed a forbidden manipulation of stock prices. In 1981, S&P 500 companies spent about 2 percent of profits on buybacks. 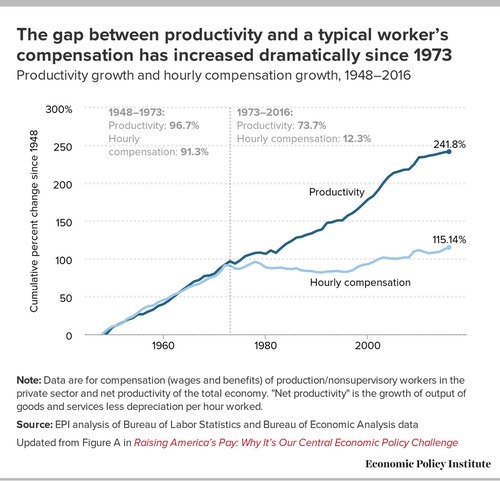 But after 1982, when the Reagan administration legalized stock buybacks, the connection between wages and productivity broke wide apart as corporate executives focused all of their efforts on increasing share value. Last year, the S&P 500 companies spent 50 percent of profits on buybacks and 41 percent on dividends to stock holders. That left a pittance – 9 percent. Corporations socked away some or all of that in overseas tax havens. Their workers, whose labor produced that profit, got virtually nothing. CEOs self-centered focus on stock buybacks is a big part of the reason Republicans’ promised raise is illusory. But it’s not just the raise. The tax cut itself is a sham. Workers can be excused for not noticing that big, fat tax cut in their paychecks. Those who earn less than $25,000 a year, that is those in the lowest fifth of income brackets, will get a tax cut this year totaling $60. That’s just about a dollar a week. For those in the middle income quintile earning between $49,000 and $86,000 a year, the average tax cut is $900. That’s $17 a week. The cost of a large pizza and a Coke. Hardly earth shattering. By contrast, the top 1 percent of taxpayers, those with incomes above $733,000 a year, will get a tax cut averaging $51,000. That’s $980 a week. So every week this year, Uncle Sam will hand the nation’s richest a tax benefit that is $80 more than the entire amount that the middle-income worker will get in a year. While they’re searching, workers will have to pay more for cars and homes and credit card debt. That’s because the Federal Reserve increased the cost of borrowing this week for the second time this year and promised two more hikes before year’s end. Fed officials said they did it because the tax break and additional federal spending have heated up the economy. It’s hot for corporations, alright, but not for workers. And the real cost to workers hasn’t yet hit. The GOP’s tax cut will add $1 trillion to the national debt. Even before passing the tax cut legislation, Republican leaders like Speaker of the House Paul Ryan began saying that workers would have to pay those costs in the form of cuts to cherished safety net programs, that is Social Security, Medicare and Medicaid. And they’re not kidding. They already tried to slash funding for food stamps, the program that feeds the poor. And now, incredibly, Republicans are planning a second round of tax cuts. They say they want to make that $17-a-week tax break for the middle class permanent. As it is now, that tax cut disappears in 2025, while the massive break Republicans gave corporations is permanent. In addition, Republicans want to slash the capital gains tax. This, again, is a tax cut for the rich. Now, it’s not as if workers haven’t benefitted at all under the current administration. Jared Bernstein, a senior fellow at the Center for Budget and Policy Priorities and former chief economic adviser to Vice President Joe Biden, estimates that the real hourly pay of middle class workers has risen 0.4 percent over the past 18 months of Republican control of Congress and the White House. At that rate, Bernstein figures, it will take 28 years for a worker to get that promised $4,000 pay bump. Where’s that $4,000 pay raise promised to the middle class?